It's been exactly a month since Gabe asked me to marry him! How on earth? People said time would fly but really?? We have officially booked our first venue tour trip to New Orleans and boy do I love priceline today. The negotiator hooked us up big time. 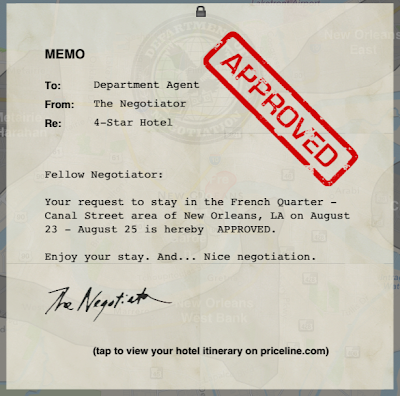 We used priceline for our last 2 trips to NOLA and have had luck bidding $85 for a 4 star French Quarter hotel during mid week into weekend trips. 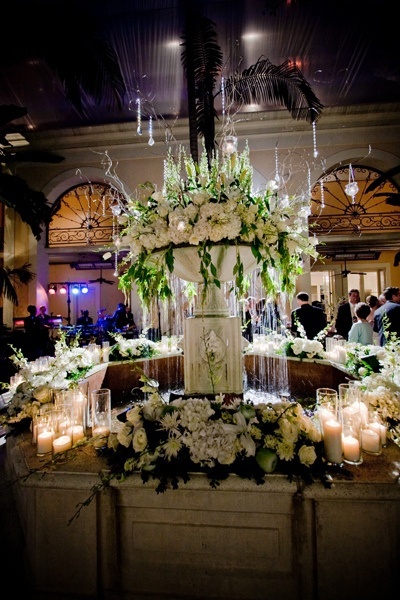 The first time, we were approved at the French Quarter Marriott. Last time, we were approved for The Saint, New Orleans. This time around, I got a little gutsier, especially since it is off season in NOLA. 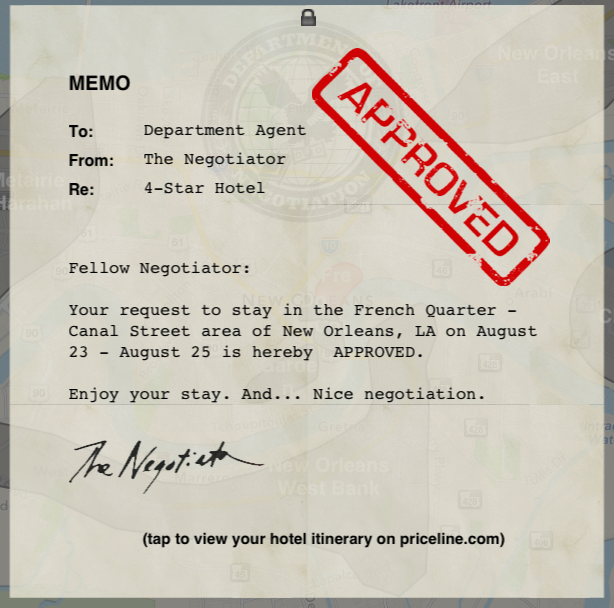 I bid $65 for a 4 star hotel in the French Quarter (on a Friday & Saturday night nonetheless) and got approved! I was not expecting that - or the fun automated letter shown above from pricelines iPad app. Would you like to know where we are staying at for this ridiculously low price? The French Quarter Marriott! I am very excited to stay at this hotel again. We really loved the convenience to everything and the staff was super nice. Also, the fact that there is a Starbucks located inside of the hotel doesn't hurt. The Saint was a very trendy and hip hotel but this was more our style. We will head over to Oak Alley Plantation for the first of our two engagement photo sessions during this trip. Our two engagement sessions are taking place in Louisiana and in Tampa, FL. 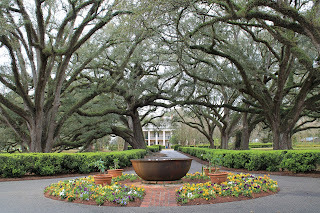 With both sets of our parents in tow, we visited Oak Alley last February and had a magical time, you can read about our plantation and grounds tour here and the dining experience here. 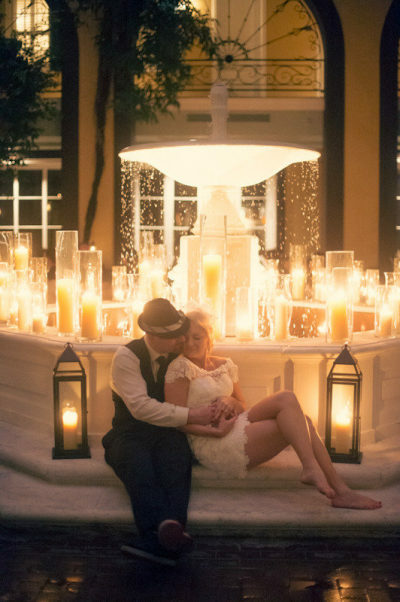 From the moment we decided to get married in NOLA, I knew we had to incorporate Oak Alley's beauty into our big day somehow. 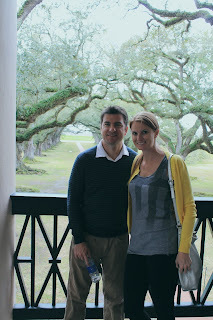 Since the plantation is an hour outside of the French Quarter, it seemed ideal to do our Louisiana engagement session there. I cannot wait to recreate these images into our engagement session! Our custom stamp from Love to Create Stamps came in the mail! It exceeded all expectations and we were very impressed with the final product. I was introduced to this line of stamps through Etsy and was pleased to hear they are located in St. Pete! Love going local! Upon checking out their website, I probably found 10 additional stamps I would purchase right now but Gabe said one stamp is all I need. He's no fun. 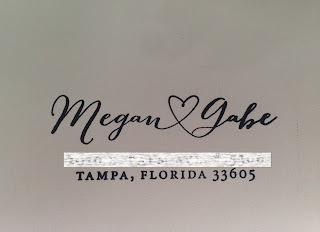 At least I know who I am ordering our monogram stamp from once we are married! Here is what the stamp looks like on paper! 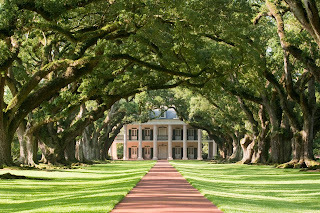 My question of the day is what type of outfit should I wear to the engagement shoot at Oak Alley Plantation? I live in sundresses and maxi-dresses so I want something different, yet not too fancy and I cannot wear heels or I will be taller than Gabe. Thanks so much!! I am still shocked that we got the hotel at that price. I'm very excited to do a shoot there - I just have NO idea what to wear at an engagement shoot. 1. I am almost as excited to see how your wedding plays out than my very own. There are so many beautiful elements that you are including, and the landscape of the plantation definitely stands on its own, too! 2. I never realized how amazing New Orleans is. Never having been there, I just imagined the Mardi Gras scene that you see on TV. Boy, are you proving me wrong. I'll have to make a trip up there. Mike has always wanted to go. 3. If I were you, I'd wear a wedding-type dress to the engagement shoot. I think a dress that is white and goes to your knees or so, with some sparkly flats, would be so pretty! And it's classic, matching with the location perfectly. Something like what this bride wore: http://www.eatliverun.com/our-wedding-5-25-13/ Ultimately, whichever outfit you choose, it's going to be awesome! Well I have to match everything so I would want to match the scenery there. I think a cute yellow dress & tan flats would be cute & Gabe in contrasting colors. When you do your fun photos you can do a black or red dress or even a used short wedding dress with the Halloween theme incorporated. Hmm I wonder if someone has a cute pair of tan Tory Burch sandals I could borrow ;) Do you remember the dress I wore to Jess & James New Years party a few years ago? It was black lace over white and I wore red tights w/ it since it was so short? I bet I could do wear that at the fun shoot (if it still fits my hips)! Wow. Amazing deal. We are still planning on going in November for my bro's bday weekend but I've yet to book a hotel. Might have to give priceline a try...LOVE the pics from Hotel Mazarin...especially the one of the candles by that founatin. Wow. And I agree with Jen, I can't wait to see how everything comes together!!!! Your engagement photos are gonna be ridiculous. I like the idea of a white tea length dress...and you could go old-fashioned and do your hair pinned back or in a soft side bun and wear one of those cute little hats that has the sheer-ish netting that'll cover like 1/4 of your face...omg...it's be perfect for the plantation background!!! Dang, now that is quite the deal you scored! We've done a few bookings with Priceline but that beats anything we've ever managed to score (I think our lowest was $80...still happy with that in the end of course)! I say wear something comfortable for pictures. Usually you'll be changing locations/poses a lot, sometimes sitting or leaning on things, etc...so make sure you're able to move around. Steer clear of prints for the most part, I'd say stick to solids, with maybe a fun statement necklace or other jewelry if you want to jazz it up! And apparently I'm still not done. I do also love the non-posed type of pictures...think about doing something that can be an "action shot" type of thing...like sharing an ice cream cone, pouring a glass of wine...something like that. Ok I'm done now I swear.